In the past, we’ve usually stayed in California for our vacations. I decided it was time that Joshua and Matthew saw a little more of the world and, on something of a whim, decided it would be cool to visit the Florida Keys. It had been a long time since I was in the land of John D. MacDonald, Ernest Hemingway, and Jimmy Buffett. I had fond memories and thought the Matthew and Joshua might make some of their own. Work was busy, and I found I didn’t have time to make the travel arrangements. Fortuitously, I ran in to an old acquaintance, Mike Lazar, at a party in the late spring and learned that he and his wife were running a travel agency. I thought the internet had killed off that industry. Dossandra was able to put together a travel package for us so that I wasn’t scrambling at the last minute. We had our usual Independence Day fireworks on July 4th, then on the fifth we had a red-eye flight out. My plan was to get to the airport early and have a late dinner while we waited for our flight. Little did I know that the airport for the capital of the seventh largest world economy rolls up the sidewalks at 9:30pm. Not even the bar was open. Fortunately, we’d had a late afternoon snack so I bought some drinks at the concession stand (misplacing my driver license in the process) before we flew to Houston and on to Miami. The plan had been to pick up a rental car in Miami and drive to Florida City, where we could visit David, an online friend of Joshua’s from World of Warcraft and then get an early start in the morning. Alas, I was unable to find my driver license in order to rent the car. Dossandra was extraordinarily helpful, calling the Sacramento airport and the concessionaire to try to find the missing document. Lyft took us from the airport in Miami to David’s inn in Florida City. Unfortunately, David was extremely busy and we were tired and jetlagged, so we didn’t get to socialize much. Still, it was nice to have a rest in a comfortable room knowing we had a friend in town. I called Enterprise Rent-A-Car and they offered to pick us up in the morning and rent us a vehicle, but instead they left us stranded in the pouring rain. The franchise wouldn’t answer the phone, even for the corporate office. Lyft came to the rescue again, and took us to the Enterprise office where my question of why they didn’t pick us up when they said they would was met with a shrug. They rented us a car, eventually, but during our first stop I noticed that the registration on the car was expired. I was kind of surprised that I hadn’t noticed, but when I looked at the “before” pictures I took of the car when we picked it up, I noticed that the helpful Enterprise employee either was standing in front of the license plate or had the hatchback open (hiding the plate) in every single photo. I’m guessing it wasn’t a coincidence. They still weren’t answering their phone, so on the advice of Enterprise corporate I drove back to the franchise and exchanged the car for one with current registration. We finally got on the road at 2pm, three hours later than planned. 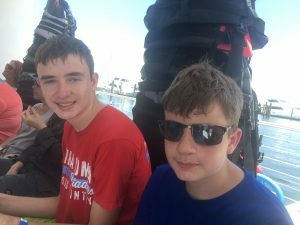 By the time we got to John Pennekamp Coral Reef State Park there were no seats left on any of the snorkeling or glass bottom boat reef tours. We had a nice walk around the park and shore and museum, but the incompetent car rental folks cost us the main reason for going there. Ah, well. We headed on south. 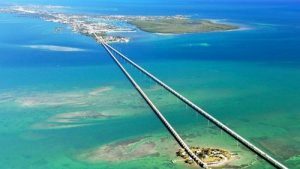 I hadn’t been to the Keys since the 1970s, and so the new roads and bridges and (mostly tourist-oriented) development was notable. We arrived at our hotel in the late afternoon, and found it delightful. 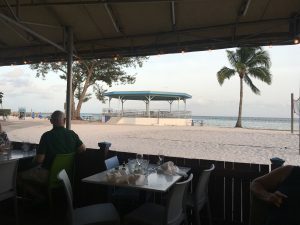 The concierge directed us to a restaurant on the sand just down the road and we had a relaxing dinner, perfect for decompressing from the traveling. A big surprise to me was how much Matthew wanted to do. 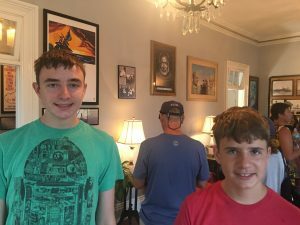 He kind of disappeared into his bedroom earlier this year—as teens will do—and I have missed the time we used to spend all hanging out in the living room, so it was cool to be doing things together as a family. Our first full day in Key West started with a visit to the Hemingway house. From there, we dined at the Blue Macaw where we were serenaded by a pan player, took a long walk across the old part of the island, then took an open tram tour. The driver/tour guide was awesome. It’s not usually my favorite way to see a place, but this time I really enjoyed it. Day 2 started with a fabulous kayak trip around some mangrove islands, then a visit to the Key West Shipwreck Museum, the Harry S Truman Little White House, and back to Salute! for dinner on the beach. Next was bicycle day. We rented bikes and circumnavigated the island, mostly looking at people and architecture. We visited the southernmost point in the contiguous US (but didn’t wait in the line for the photo op) and stopped at Zachary Taylor State Park. 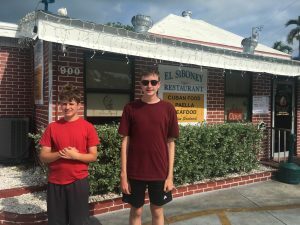 We took a snorkeling trip out to the reef, and found a delightful little Cuban restaurant that served both the best and least expensive food we had on the whole trip. We even took a “Ghosts and Gravestones” tour which, while not the highlight of the trip, was kind of fun and got us inside some landmarks at night. When we weren’t touring, we enjoyed the balmy summer evenings in the hotel pool. We had a fabulous (if somewhat footsore) time, and I was sorry when it came to an end. When I was renting the car, I asked the agent three separate times about dropping the car off at the Key West airport. “No problem,” said he. Yet, when we arrived at the airport there was no sign of an Enterprise agency. I finally went inside and asked at the Hertz counter. Laughing, they said the Enterprise agency was on the other side of the island, but they often neglect to explain that to customers. Sigh. Fortunately, I’m the nervous sort who always gets to airports too early, so we actually had time to drive across the island (it’s not very big), drop off the car, and get a ride back to the airport. 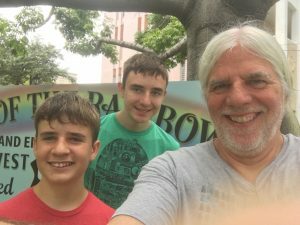 When I was planning the trip, I asked Joshua and Matthew if they wanted to go to Walt Disney World. I kind of expected them to say no, but I was wrong. So we booked three days at the resort on our way home. We’re Disneyland veterans, but I wasn’t aware that you can get FastPass reservations online 30 days in advance at WDW. (At Disneyland, at least the last time we were there, you could only get a FastPass by physically visiting the attraction on the day of your visit.) 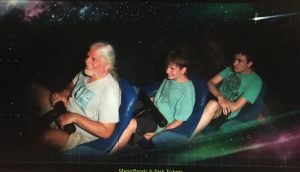 Though many of the E-ticket attractions were booked, we nonetheless managed to ride most of the rides of interest at three of the parks without significant waits. The exception was a two-hour line to see the Avatar Flight of Passage ride in Animal Kingdom. Ugh, that’s a long (if exceptionally visually entrancing) queue, and I wouldn’t do it again but I’m glad we got to experience it. In all, for someone who grew up in SoCal (and lived for a while walking distance from Disneyland with a Club 33 membership) it was interesting to see what Disney can do when not constrained so much by land values. Seeing WDW was fun, but I’m glad we spent most of our time in the Keys. In spite of it being much more touristy than when I was there in the 70’s, the people still seemed genuinely friendly (as opposed to Disney friendly, which is okay but not quite the same). I don’t think I could have tolerated much more paying $50 for three hot dogs for lunch and needing to wait in line for everything. Luck was with us weather-wise, as we hardly got rained on at all and even though everyone complained about the heat, it was actually cooler during the day than home in Sacramento (though somewhat more humid). If not for the fact that I have no love for coast-to-coast airline flights, I could make the Keys a regular vacation destination.